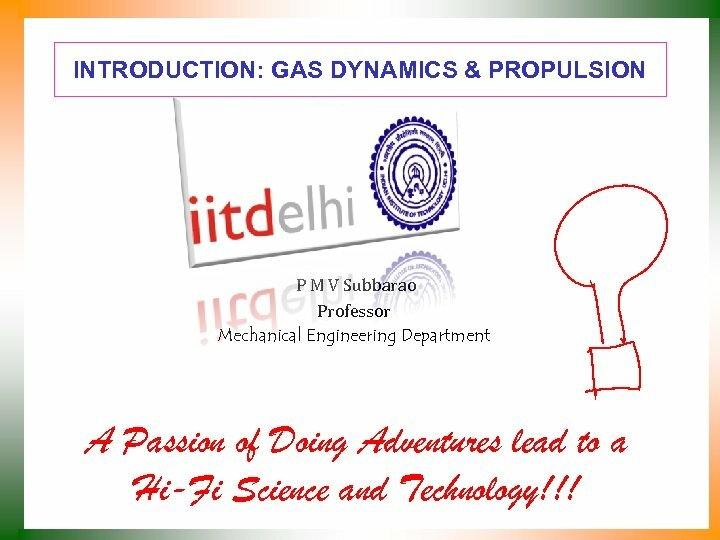 INTRODUCTION: GAS DYNAMICS & PROPULSION P M V Subbarao Professor Mechanical Engineering Department A Passion of Doing Adventures lead to a Hi-Fi Science and Technology!!! 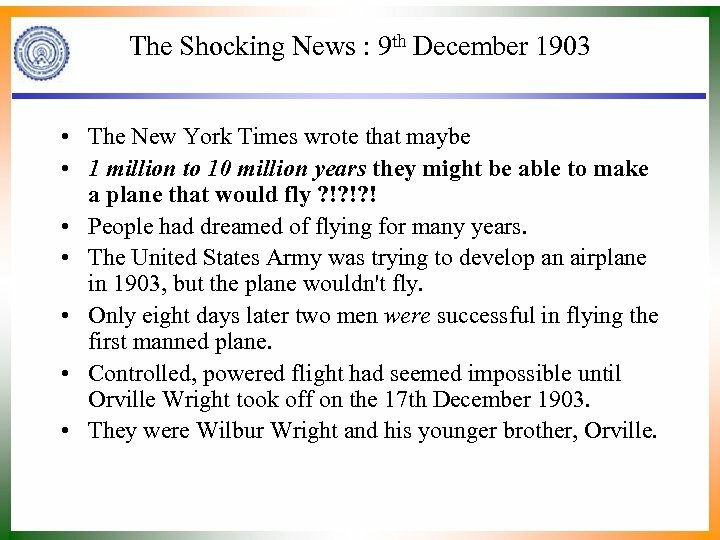 The Shocking News : 9 th December 1903 • The New York Times wrote that maybe • 1 million to 10 million years they might be able to make a plane that would fly ? !? !? ! • People had dreamed of flying for many years. • The United States Army was trying to develop an airplane in 1903, but the plane wouldn't fly. • Only eight days later two men were successful in flying the first manned plane. • Controlled, powered flight had seemed impossible until Orville Wright took off on the 17 th December 1903. 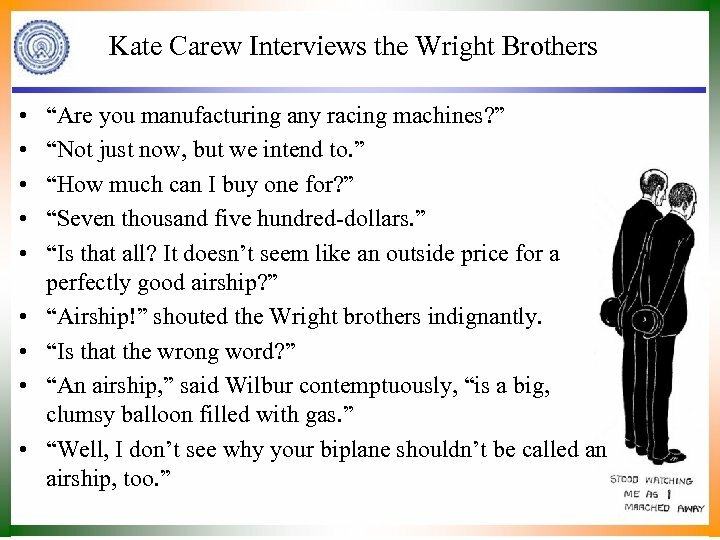 • They were Wilbur Wright and his younger brother, Orville. 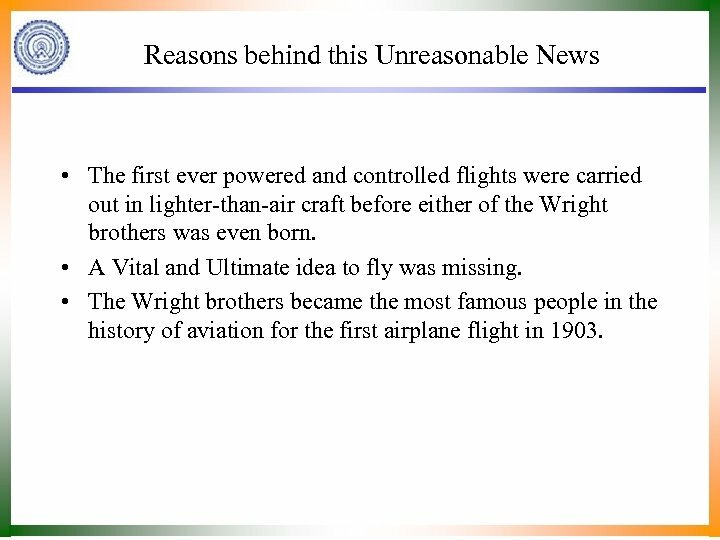 Reasons behind this Unreasonable News • The first ever powered and controlled flights were carried out in lighter-than-air craft before either of the Wright brothers was even born. • A Vital and Ultimate idea to fly was missing. • The Wright brothers became the most famous people in the history of aviation for the first airplane flight in 1903. 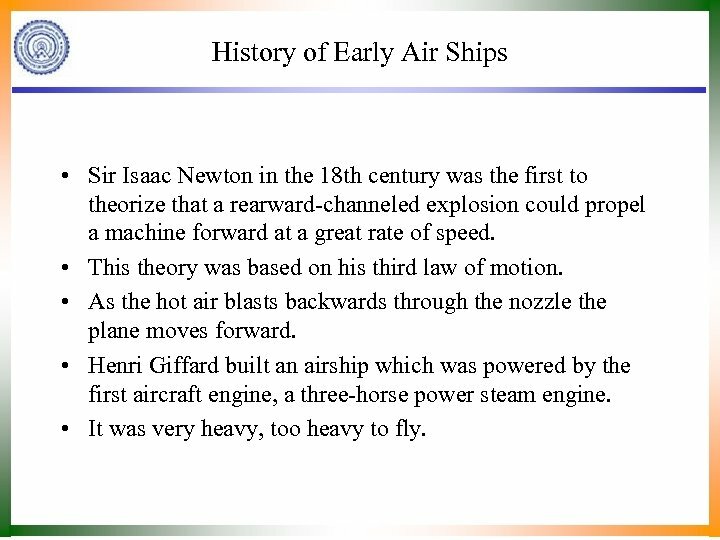 History of Early Air Ships • Sir Isaac Newton in the 18 th century was the first to theorize that a rearward-channeled explosion could propel a machine forward at a great rate of speed. • This theory was based on his third law of motion. • As the hot air blasts backwards through the nozzle the plane moves forward. 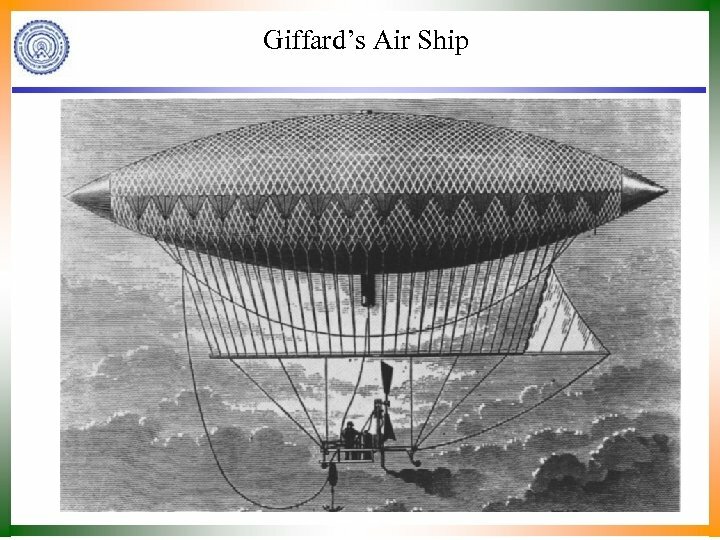 • Henri Giffard built an airship which was powered by the first aircraft engine, a three-horse power steam engine. • It was very heavy, too heavy to fly. 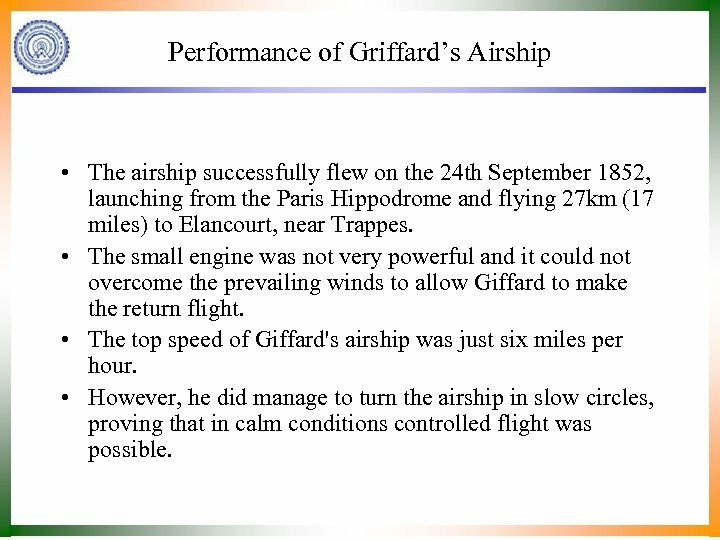 Performance of Griffard’s Airship • The airship successfully flew on the 24 th September 1852, launching from the Paris Hippodrome and flying 27 km (17 miles) to Elancourt, near Trappes. • The small engine was not very powerful and it could not overcome the prevailing winds to allow Giffard to make the return flight. • The top speed of Giffard's airship was just six miles per hour. • However, he did manage to turn the airship in slow circles, proving that in calm conditions controlled flight was possible. 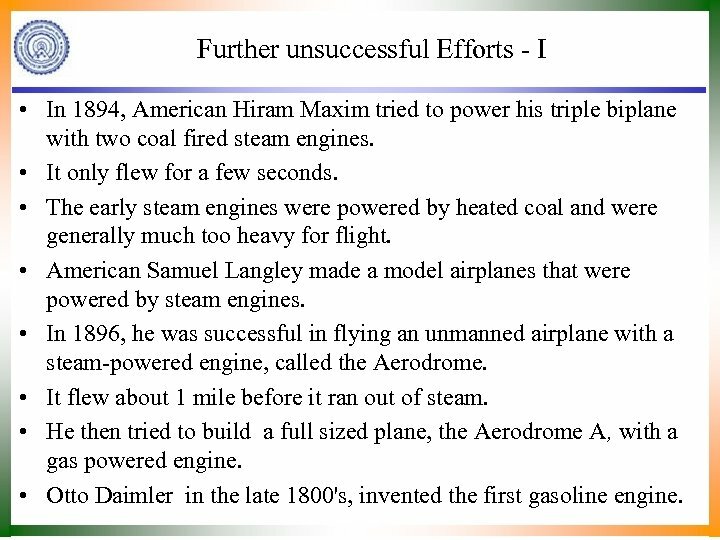 Further unsuccessful Efforts - I • In 1894, American Hiram Maxim tried to power his triple biplane with two coal fired steam engines. • It only flew for a few seconds. • The early steam engines were powered by heated coal and were generally much too heavy for flight. • American Samuel Langley made a model airplanes that were powered by steam engines. • In 1896, he was successful in flying an unmanned airplane with a steam-powered engine, called the Aerodrome. • It flew about 1 mile before it ran out of steam. • He then tried to build a full sized plane, the Aerodrome A, with a gas powered engine. • Otto Daimler in the late 1800's, invented the first gasoline engine. Further unsuccessful Efforts - II • In 1903, it crashed immediately after being launched from a house boat. • In 1903, the Wright Brothers flew, "The Flyer", with a 12 horse power gas powered engine. • From 1903, the year of the Wright Brothers first flight, to the late 1930 s the gas powered reciprocating internalcombustion engine with a propeller was the sole means used to propel aircraft. 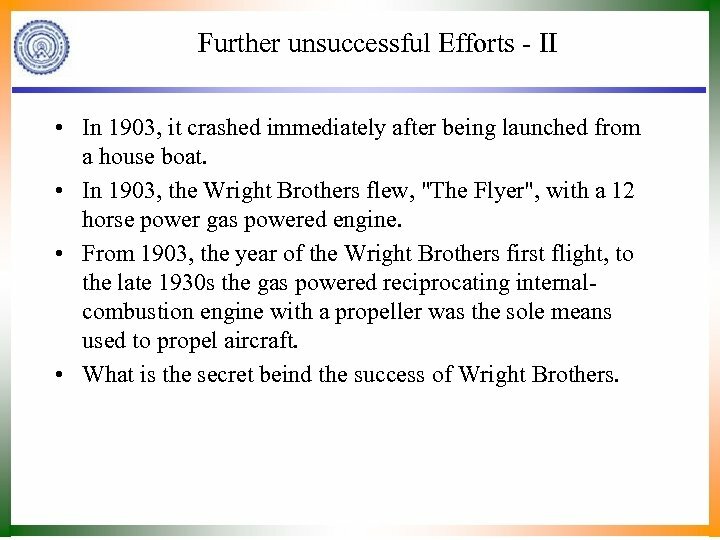 • What is the secret beind the success of Wright Brothers. 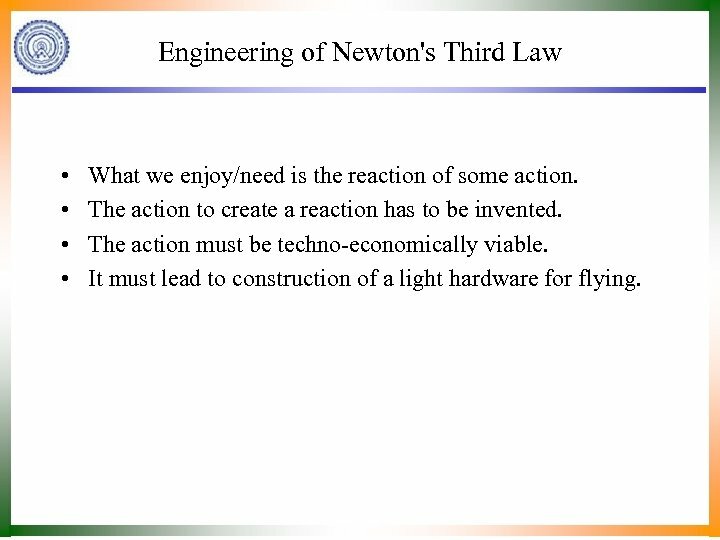 Engineering of Newton's Third Law • • What we enjoy/need is the reaction of some action. The action to create a reaction has to be invented. The action must be techno-economically viable. It must lead to construction of a light hardware for flying.